WOW! YOU TOO CAN BE AT NEWGRANGE DURING THE WINTER SOLSTICE! I've been to Newgrange, County Meath in Ireland, a couple of times but not in December. So although I wasn't among the lucky, I was delighted to see that through technology we can all experience this amazing sunrise within the megalithic monument of Newgrange. This year, a record 28,106 people from around the world applied to be one of the 50 lucky people allowed into Newgrange's cramped chamber, on one of the five days surrounding the solstice. There were 20 people inside the chamber on Friday morning (the 21st of December) who had won the annual lottery to get inside the chamber to witness the phenomenon. Outside the megalithic monument, more than 200 'dawn watchers' had been gathering from the very early hours to wait for the sun to come up over the hill on the far side of the Boyne Valley and, this year, they got to see the spectacle as it was broadcast on the large screen erected outside. No rain or clouds but perfect sunrise, as you'll see for yourself! From 8.58 am to 9.15 am, the winter sun shone through the roof box beginning with a small shaft of light that culminated in the full illumination of the chamber. The solstice phenomenon doesn't just occur on the shortest day of the year but for a number of days either side of the date and 'dawn watching' takes place for a total of six days when members of the public who won their places in the draw conducted earlier in the year are permitted to enter the passage tomb. BEWARE E-BAY IS NOT FOR ANTIQUITIES! probability' smuggled out of Iraq illegally, government officials said in a statement. Fischer said the tablet had yet to be deciphered. Cuneiform tablets were used throughout the Middle East and ancient Persia during the last three millennia BCE for recording everything from great deeds of leaders to routine correspondence and bookkeeping. $430,000 or jail time if convicted of breaking Swiss embargo laws on the transfer of cultural goods. An undated picture from the Iraqi Ministry of Culture, Tourism and Antiquities showing artifacts recuperated by the Iraqi Museum which were looted during the 2003 US-led invasion in Iraq. (AFP: Iraqi Ministry of Culture) An Iraqi government official says lured by offers of rewards, Iraqis are increasingly handing in an assortment of cups, vases, statuettes, daggers, plates and coins dating back to the very cradle of civilisation. "We had 594 pieces returned this week alone," Abdul Zahra al-Talaqani, media director in the ministry of culture, tourism and antiquities, said in his office in Baghdad's tightly-protected Green Zone. The antiques, unless clearly identifiable as stolen museum pieces, which are stamped, are sent to a laboratory for testing. "We get many fakes," Mr Talaqani said. He says that in all, at least 32,000 items of antiquity are known to have been pillaged from the National Museum in Baghdad and the country's 12,000 archaeological locations since the US-led invasion almost five years ago. The actual number is believed to be far higher. Many items were not recorded and some are still disappearing from the thousands of archaeological sites in Iraq. Wispy-bearded Mr Talaqani bitterly blames the US military as being responsible for a large share of the looting by failing to protect the valuable items. "There are two seas in Iraq - a sea of oil and a sea of antiquities. The multinational forces have done everything to protect the sea of oil but they have done very little to protect the other sea. Among the more important pieces known to be missing are a Sumerian period female head from Uruk - modern Warka - and large numbers of plates, daggers, cups and statues, of both human and animals, from the Babylonian and Assyrian periods. 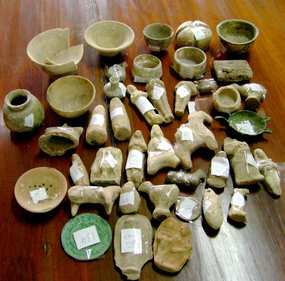 Since 2005, when the ministry was set up, a worldwide search has been underway to recover the looted pieces. The process has been speeded up since the appointment of an acting minister of tourism and antiquities, Mohammed Abbas al-Oreibi, in September. The post had been vacant since April, when the political wing of Shiite cleric Moqtada al-Sadr, which controls the ministry, quit Prime Minister Nouri Al-Maliki's cabinet. Mr Oreibi has made the recovery of antiquities his priority and has instituted a reward system under which people are paid from 10,000 dinar ($9) to a handsome five million dinar (about $4,566) for turning in antiquities. Mr Talaqani says the scheme is having a significant impact. "People are turning up in numbers for the rewards. The amount we pay depends on the value of the object. For low-value items we pay, 10,000 dinars just to encourage people," he said. A five million dinar reward was paid out a few weeks ago to a man who handed in a gold coin from the Ommayad era - one of the first Islamic coins ever minted. Mr Talaqani says special police task forces have also been formed to patrol routes through Iraq's deserts to neighbouring countries and are having success in intercepting smugglers. On November 14, a gang was caught heading through south-western Muthanna province towards Saudi Arabia with a large number of items, some of which had already been damaged and some of which were found to be fakes. Acting minister Mr Oreibi has been in touch with the authorities in Syria, Turkey, Kuwait, Saudi Arabia, Iran and Jordan to help him find objects being sold on the black market, and has put Iraqi embassies across the world on the alert. Former director of the museum, Donny George, now living in exile in New York, said the museum had to be closed because the sectarian violence ravaging Baghdad made it too risky for staff to go to work. Efforts to reopen the museum have stuttered and no date has yet been set. Yet just recently there was an article saying a few rooms might open soon. So the confusion about this incredibly important National Museum continues.